Why did the Russian chicken cross the border? Russia's main food exports are grain and vegetable oil, and the domestic market is already saturated with poultry, pork and sugar. 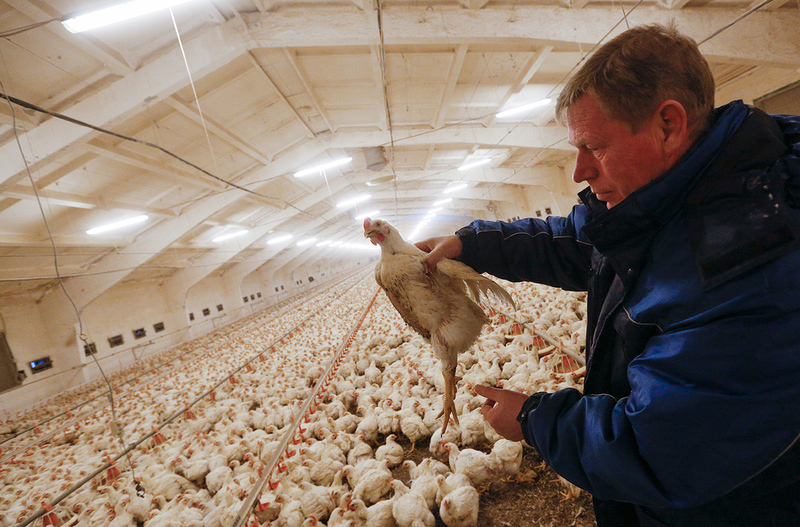 Photo: Chicken farm in Kabardino-Balkaria, Russia. While Russia has for years exported wheat and other grains, the country still imports many basic foodstuffs. 2017 might be the year, however, that Russia becomes an overall net exporter of agricultural products. This development is a positive side-effect of economic sanctions, which have spurred domestic production. This year Russia plans not only an increase in grain and vegetable oil exports, but it also hopes to enter global markets with new products - poultry, pork, sugar, potatoes, and etc. Overall, 2017 agricultural exports are expected to exceed imports, according to a new report by the Russian Presidential Academy of National Economy and Public Administration (RANEPA), the Gaidar Institute, and the Russian Foreign Trade Academy. In 2015 Russia was second in the world for wheat, barley, buckwheat and sunflower oil exports. If this trend continues food exports this year can exceed food imports, and "the country will become a net exporter," said the report. Some experts disagree, however. "Such a development is unlikely this year," said Andrei Sizov, executive director of SovEcon, an research and analysis center. The volume differences between exports and imports is still quite significant, Sizov pointed out, and he does not see factors that would lead to a drastic increase in exports or a decrease in imports. "If the economy will start to grow then this can actually lead to a growth in imports," said Sizov. "Moreover, the ruble is getting stronger, which would make exports more expensive and less competitive globally." Russia's main food exports are grain and vegetable oil, and the domestic market is already saturated with poultry, pork and sugar. "Further development requires export, and if that doesn’t happen then there won’t be growth in these sectors whose domestic markets are saturated," said Vasily Uzun, one of the authors of the report, and chief scientific researcher at the Center for Agro-Food Policy. "Certain items grow well in Russia - carrots, potatoes, onions, cabbage, and etc.," said Uzun. "They are relatively cheap, and so Russia can compete with them on the world market. We need a state policy to support getting food to world markets." The government, however, has made it clear to farmers that they should not look to it for more support, which will remain at the level of last year, said Prime Minister Dmitri Medvedev earlier this month. He also recommended that farmers not expect a quick cancelation of the anti-Russian sanctions, and instead, continue to use the restriction on imports to their advantage. "We had a very good harvest and have superb transport capabilities, but it’s still not clear how the world market will react," said Alexander Korbut, vice-president of the Grain Union. Many things depend on market prices, but they are difficult to predict, added the expert.